Early in The Legend of Zelda: Breath of the Wild, I discovered a puzzle shrine containing a small maze. Inside that maze was a little ball. The goal, I realized, was to maneuver the ball out of the maze and slide it into a nearby funnel. To do this, I’d have to rotate my Nintendo Switch controller, using motion controls to turn the maze around and let gravity move the ball through each corridor. One wrong move and the ball would fall out, forcing me to start again. After struggling a few times to solve the puzzle thanks to Newton’s dumb laws, I noticed that every time the ball fell, a new one would drop from a canister several feet above the maze. Then I had a wild thought. Just before a new ball dropped, I turned my controller upside down, flipping the maze 180 degrees. There was nothing on the other side, so I now had a nice flat surface on which to roll the ball. I slowly tilted the maze’s newly exposed backside and dropped the ball right into the funnel, skipping the maze entirely. Boom. Puzzle solved. For decades now, Zelda games have been about what you can’t do as much as they are about what you can. You can’t pick up that rock until you find the Power Gloves. You can’t go swimming until you buy Zora’s Flippers. See that big gap? You can’t cross it until you get the Hookshot. Since Link to the Past, just about every Zelda game has followed this same rhythm: You start off in a narrow world that gradually expands as you make progress. You see a wall with cracks in it and make a mental note to come back once you snag some bombs. Your curiosity is piqued by what you can’t yet access, and every new dungeon brings with it a rush of dopamine as you wait to see what helpful new gadget you’ll find there and what kind of secrets it will let you discover. Breath of the Wild rewards curiosity in a way that no other Zelda has explored. The Legend of Zelda: Breath of the Wild, in contrast, is all about what you can do. This is a game that says “yes” to anything you ask of it. From the very beginning, you can swim in any lake, pick up any boulder, and cross any pit. When you try some crazy experiment, the game will oblige. You can climb up any wall, mountain, or tower in the world, which allows you the freedom to explore the map in a way that no Zelda game has matched. Breath of the Wild never asks you to wait for a new item before you uncover its secrets. It just keeps saying yes. In 1986, The Legend of Zelda conjured the illusion that you could explore a boundless world. Its single-screen areas were metaphors. Like the town icons on the world map of a JRPG, The Legend of Zelda’s pixely mountains and forests were meant to represent a grander topography. Our imagination did most of the work. Today the first Zelda may look dusty and primitive, but it’s not hard to see why it had such an impact. It felt infinite. In 2017, we don’t need our imagination anymore. The Legend of Zelda: Breath of the Wild doesn’t just evoke the feelings of a boundless world; it gives you one. The game feels, in so many ways, like what Zelda has always strived to be. Free of the traditions that the series has followed so rigorously over the past decade, Breath of the Wild emerges triumphant. It is groundbreaking. It is the pinnacle of Zelda. Zelda games typically follow a common progression: You, as the pointy-eared adventurer Link, start off asleep in a bed. You are woken up, told you are a hero, and sent off to go find a sword somewhere. After some tutorial sections, you’ll learn that there are X MacGuffins out in the world that you’ll have to go save/recover/find. Each one of these MacGuffins is linked to a dungeon, and each dungeon contains a different key item. Already you know what some of those items will be: bombs, a boomerang, a hookshot. There’s always some sort of gimmick, like a mirror that transports you between worlds or a musical instrument that can control time. Interspersed between each dungeon are various quests and secrets, and once you’ve acquired all of the MacGuffins, you’ll fight Ganon. End of game. When you first start off Breath of the Wild, it seems to follow that same pattern. You are woken up from a cryogenic sleep chamber inside of a small cave. You are told that you are a hero. You pick up a multi-purpose tool called a Sheikah Slate—your gimmick item—and grab a shirt and pants from nearby chests. Then you make your way toward the exit and find something unusual: a wall, blocking your progress. There are no buttons or switches, no cracks for a bomb or pegs for a hookshot. Instead, you learn, you are meant to jump onto the wall and climb it. This revelation may inspire in Zelda devotees a series of exciting thoughts. Is this a new ability? Is it just situational? If you can climb this wall, what else can you climb? Once you leave the cave and squint your way into the sunlight, you might experiment with this newfound ability and discover the answer: You can climb everything. Link can scale almost any surface in the game, from cave walls to cliff-sides, which is a thrilling way to traverse the world. Think about it like this: As you are exploring Breath of the Wild’s massive version of Hyrule, you’ll never have to stop because there’s something in your way. Once you’ve escaped the cave, you’ll probably be bracing yourself for Breath of the Wild’s inevitable tutorial section. (You might think: If it’s anything like the last console Zelda game, Skyward Sword, it’ll be an hour or two before the real game starts.) Then, as you walk down the rocky path outside, it’ll dawn on you: There is no tutorial section. The real game has already started. You can go talk to that important-looking bearded man a few feet away or you can just start walking in a random direction, climbing over any obstacle you find. You don’t have to go find your sword. You can just pick up a nearby stick, or steal the old man’s axe, or defeat a monster and take its weapon. A blue spirit won’t pop out and tell you that no, you shouldn’t go that way until you talk to the old man. Breath of the Wild always says yes. Fi and Navi and Midna aren’t welcome here. Consider the Zelda pattern broken. The first time you find a boomerang won’t be prefaced by Link peeking into a glowing chest as music swells. You’ll just kill a monster and take its boomerang. Breath of the Wild does have MacGuffins, as you’ll eventually learn, but instead of getting them in linear progression, you can go hunt them down in any order. Or you can ignore them entirely and just go fight Ganon with three hearts and no clothing (which will no doubt lead to some incredible speedruns over the next few months). When you emerge from that opening cave, you’ll find yourself on a vista, peeking out at the beautiful mountains and ruins of Hyrule as the “Breath of the Wild” title appears on screen. In another Zelda game, those mountains and ruins would be part of the scenery. If you could go there at all, you’d be confined to a specific area. In Breath of the Wild, you can walk across every inch. I recommend playing Breath of the Wild with a notebook, not because you’ll need it to solve puzzles (the way you would in, say, The Witness, a game that resembles this one in some unexpected and striking ways) but because you’ll want to keep a to-do list. It’s easy to get distracted, to be walking toward one goal only to see something enticing in the distance. It’s helpful to remember that you really want to go check out that strange-looking ring of rocks once you’re done exploring the ruins (but also, you really should go finish that one sidequest). A slice of gameplay might look something like this: You walk into a new region. It’s themed in some way, maybe based on a desert or a tropical jungle. You see a big, glowing tower—one of the structures in each region that you scale in order to fill out more of your map, Ubisoft-style. You tag it with your binoculars, then head in that direction. On your way, you collect some herbs (which you’ll cook next time you find a fire) and kill a couple of Chu-Chus, grabbing the jelly they leave behind (useful for elixirs). Link can climb anything in Breath of the Wild, including these towers, which help reveal the terrain and topography contained in each region of Hyrule. There are a few things to keep in mind as you go. Climbing walls and mountains will gradually drain your stamina, an upgradable energy meter that you’ll also use while running and using Link’s portable hang glider. If you run out of stamina in the middle of a climb, Link will plummet, potentially to his death. You’ll have to be a little careful, sizing up mountains and walls to make sure you can actually climb them before you start scaling. But the rules are flexible. Your movement is based on physics rather than a “navmesh”—which, in English, means that Link can walk on anything in the world—so there are ways to manipulate the way Link moves. If you see little ridges on a mountain, you can often get Link to stop climbing and just stand on them for a few seconds, recovering his stamina so you can climb further. Is this sort of extended climbing an unintentional effect of the game’s code? A devious way to make the player feel smart? Or the net result of a video game that’s designed around saying “yes” to everything? Breath of the Wild’s entire world is based around that philosophy, which may sometimes make you feel like you’re cheating. You can use ice arrows to freeze a monster, then shatter him with a sledgehammer, killing him instantly. You can light a fire with some wood and flint, then use the drafts created by that fire to propel yourself in the air so you can then glide to an unexplored area. You can play around with gravity, inertia, and all of the other physics rules that Nintendo stuck in this game, using them to manipulate and break the world. There are times when you may feel like you’re accessing places that you’re not supposed to reach yet, but Breath of the Wild would disagree with that perspective. Breath of the Wild wants you to go wherever you want. Every new enemy camp is a new opportunity to play around with the physics to see what kind of wild chemistry experiments you can embark upon. Breath of the Wild also wants you to feel like exploring is a worthwhile use of your time, which it accomplishes in several ways. First, by letting Link choose from a wide variety of weapons and gear. Second, by sprinkling puzzles and shrines throughout the world. (Shrines serve as both fast travel points and mini-dungeons. There are around 100 in the game, and for every four you complete, you can upgrade your health or stamina.) And third, by making every item useful. There are hundreds of objects all across the world that you can harvest and collect, from apples to snails to precious minerals. Find a fire and you can combine these objects, cooking them to make valuable food and potions. The better your stock of food and potions, the better your chances of surviving a tough encounter. Survive the tough encounter and you’ll find more puzzles, shrines, and gear. And so on. This may make you wonder just what kind of game Breath of the Wild is. It’s a Zelda where you switch weapons and chop down trees? What? It’s safe to say that you’ve never played anything like it before. Because even as Breath of the Wild takes liberally from other games (a long list that includes Far Cry, Skyrim, and even Portal) it never stops feeling like Zelda. That isn’t just because you wear a tunic and solve problems for rock-eating Gorons; it’s because Breath of the Wild feels polished and carefully crafted in the way that Nintendo has mastered over the past few decades. The new Hyrule feels huge, but never empty. It feels vast, but never random. There are puzzle clues and design tricks all throughout the world, which is dense and full of secrets. Even the placement of rocks feels deliberate. For those of us who rank Link to the Past and Wind Waker among the greatest games of all time, this was more than a little alarming. A Zelda without traditional puzzles? The main reason to play Zelda was the excitement of finding a new dungeon, picking it apart, and solving a series of progressively difficult puzzles with whatever object you’d find there. Wasn’t it? Each of Breath of the Wild’s 100-something puzzle shrines comes with a clue that will help you figure out how to solve its riddles. Breath of the Wild answers that question with a resounding “nope.” You won’t push blocks on buttons in the newest Zelda (although you might move them around with magnets), and there are no specific dungeon items that will let you forge new paths. Yet the game never feels short on puzzles. It is, as Aonuma promised, a reconstruction of “puzzle-solving” in a Zelda game. You stumble upon an enemy encampment. There’s a Bokoblin on a tower, pivoting every few seconds to look out for intruders like you. Three other Bokoblins are sitting around a campfire. On the other side of the encampment, there’s a big cliff with a well-placed boulder resting on the edge, right on top of the Bokoblin camp. How do you take them all out? You need to access a new region, but it’s uninhabitably hot. Walking around in this new region will damage you and set your equipment on fire. What can you do to get through safely? You enter a puzzle shrine. There’s an ice cube on the ground. You have to bring it across a series of platforms full of jets that shoot flame. But the flame is melting your ice cube. How can you get it where it needs to go? You find a big metal ball tied next to a well. What is it? Some of these puzzles have multiple solutions, and some of them can be quite difficult. Occasionally you’ll want to manipulate the physics system to solve a puzzle, as I did when I flipped around that maze, and sometimes the best option is simply the most logical one (put the ball in the well). Other times, the best option is to leave a puzzle shrine and go find something else to do for a little while. There are hundreds of cooking ingredients throughout the world, and experimenting with them on a fire can lead to some useful treats. Because you can explore Breath of the Wild’s enormous world in any sequence that you’d like, and because there are no gates blocking your progress anywhere, there is no way for the game to offer any sort of escalating puzzle progression. Which makes for a dilemma. If you’re not getting new items or abilities all the time, how can this Zelda introduce new types of puzzles? How can it ramp up the difficulty in a way that feels natural? Of course, this isn’t the first time Zelda has tried to go non-linear. With Link Between Worlds (2013), Eiji Aonuma and crew had already played around with the standard progression formula. Rather than acquire a new item in each dungeon, you’d buy or rent everything from an item store in the center of the map. Each dungeon required one specific item, and you could do them in any order, with the assurance that, for example, the bomb dungeon wouldn’t have any puzzles that required the fire rod. While this led to an excellent Zelda game—and Link Between Worlds had some stellar dungeons—it also made the puzzles a little too easy. You immediately knew that every puzzle in the bomb dungeon required bombs, so the solutions became apparent fast. The Legend of Zelda: Breath of the Wild takes another stab at this problem. You start off the game on an area called the Great Plateau, where you’ll be stuck until you get a paraglider that lets you float down to the world below. Before you get this paraglider, you have to finish four puzzle shrines that will get you four key abilities, allowing you to: throw bombs, use a magnet to move metal objects, freeze time for an object and conjure frozen ice columns from water. Until you have these abilities, you can’t get off the plateau. The magnet ability allows you to move metal objects around the world, no matter how big they are. This is technically the only time the game says “no,” because you can’t leave until you get the tools. But those very tools are the things that allow the designers to present constantly varied puzzles, safe in the knowledge that you have a variety of possible solutions. It’s a brilliant bit of subterfuge. Now, you can go anywhere, and the game can come up with all sorts of tricks to throw your way, knowing that you’ll have access to all four of these abilities no matter what. You won’t get new items that’ll help you solve puzzles the way you would in previous Zelda games, but dozens of hours into Breath of the Wild, you’ll still encounter new combinations that will stump you. It always feels like you’re making progress, because you’re constantly collecting new things and upgrading your gear and finding new secrets. And then there are the dungeons, whose nature I won’t spoil but which are very different than any Zelda dungeon to date. Instead of introducing a series of stand-alone puzzle rooms, each of these dungeons serves as one big puzzle with its own rules and ideas. 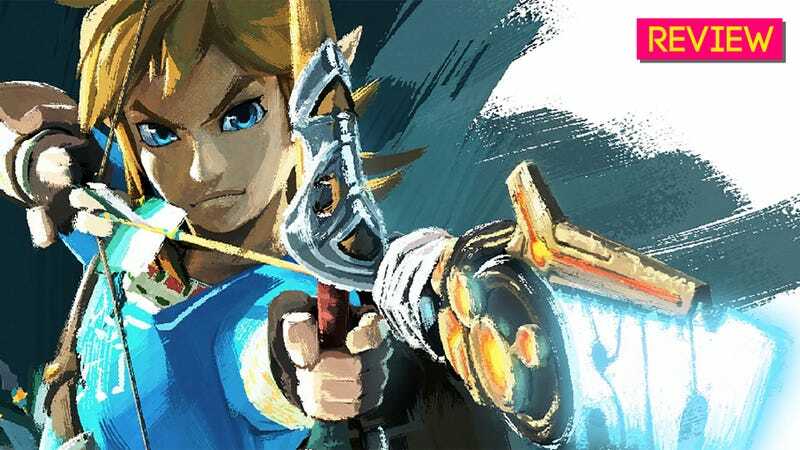 Breath of the Wild won’t offer that traditional Zelda feeling that you’re powering through dungeons that escalate in scale and complexity as you go, which may make some fans wistful, but this new Zelda has dungeons that feel plenty complex on their own. No hookshots or spinners necessary. And, not to worry, there are no block puzzles. Though you may get sick of moving orbs around. Here is a complaint about The Legend of Zelda: Breath of the Wild. The “sprint” button is mapped by default to X. You can swap it to B, but either way this poses a problem: To run and move the camera at the same time, you need to put your right hand into “claw” position, which is neither comfortable nor sustainable. The L3 button, which should let you sprint, is in fact the crouch button. There is no way to remap it. For a game that so often says yes, Breath of the Wild’s insistence on saying “no” here is baffling. It’s tough to review a game like Breath of the Wild without giving away too many of its secrets. Should I tell you about what I found on that tiny island in the middle of a sea of lava? Should I talk about what I discovered when I tried to climb a certain landmark that you wouldn’t think was climbable? Should I recount the story of the time I chugged a fireproof elixir and ran through Death Mountain, making it to Goron City just as the elixir wore off and my hearts started to drain? Zelda’s traditional goofy humor is all over Breath of the Wild. There’s a surprising amount of dialogue, localized impeccably by Nintendo’s talented Treehouse team. I won’t tell you more about the dungeons. They’re too cool to spoil. I won’t tell you about the dramatic, optional set-piece that my colleague Kirk excitedly urged me to go check out. He wouldn’t want me to spoil it. This is a game that will dominate dinner conversations. It’s a game that will lead to countless anecdotes, discoveries, and swapped stories. Already, colleagues and I have spent a great deal of time comparing notes and talking about how we solved major puzzles. For one early section in which you have to figure out how to get Link through a freezing cold mountain, three Kotaku writers found three completely different ways to proceed. We’ve discussed surprise boss encounters, hidden puzzles, and where to find all the Korok seeds that are sprinkled across Hyrule. We’ve talked about Breath of the Wild’s mysteries and weird secrets, telling tales about the time one of us jumped down to a crevasse that seemed unexplorable, but in fact contained a new shrine: the designers’ way of rewarding curious players. Phrases like “See that area? You can go there” have become nonsensical (and misleading) marketing buzzwords, but in Breath of the Wild, you really can go to any area you see. And as you talk about Breath of the Wild with your friends, there’s one word that will rarely if ever come up: “can’t.” Stories about the new Zelda will instead revolve around what you can do. How you climbed all the way to the top of the Temple of Time just for kicks, or how you parachuted down to the lowest point of Hyrule to see what kind of secrets you’d find there. How you found a brilliant method to brute-force your way through the freezing, snowy mountains, or how you set a forest on fire just to see if you could. Or, how you tried something as ridiculous as flipping over a maze so you wouldn’t have to solve it, and the game somehow let you finish the puzzle anyway. Breath of the Wild is the best Zelda game to date, and it accomplishes that simply by saying yes.